Security forces have reportedly killed more than 2,000 PKK terrorists in operations inside Turkey since they began on July 22, interim Interior Minister Selami Altınok told Anadolu Agency's Editor's Desk Monday. "Since July 22, a total of 2,483 terrorist attacks have taken place in Turkey, and gendarmerie and security and armed forces have conducted 4,328 operations in the country in which over 2,000 terrorists were killed," Altınok said. He added that Turkey would not allow anyone to harm its sovereignty. About security measures being taken for the upcoming Nov. 1 elections, Altınok said: "We are taking precautions for ensuring the safety of election with 385,000 security forces, including 255,000 police officers and 130,000 ground forces." Concerning the reasoning behind the curfews in some provinces, Altınok said: "The main reason is to ensure security and protect the life and property of our citizens. We will separate our citizens from terrorists. We will make special efforts to prevent our citizens from getting hurt." Renewed violence in Turkey came in the wake of a July 20 Suruç suicide bombing, which left dozens of people dead and was blamed on the Islamic State of Iraq and al-Sham (ISIS). The subsequent PKK-linked murder of two police officers at their home sparked a new wave of violence in the country. The Turkish Army has conducted airstrikes against 17 PKK targets in northern Iraq on Saturday, the General Staff confirmed on its website. The announcement said 17 shelters belonging to the PKK have been destroyed. According to a statement issued by the General Staff, nine F-16 fighter jets hit hideouts and underground ammunition depots belonging to the PKK in the mountainous area of Metina and the Qandil Mountains as well as in the towns of Sina and Haftanin in Northern Iraq. 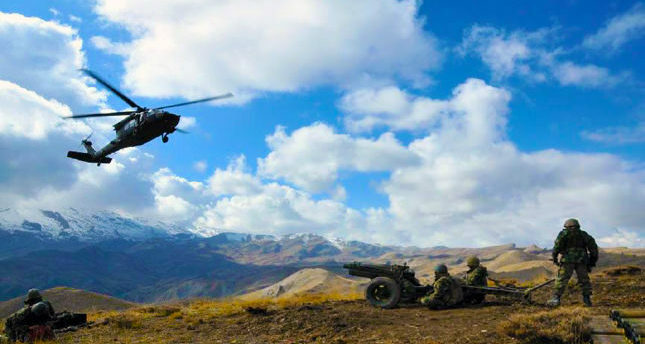 The Turkish Army also said it conducted both airstrikes and military operations on shelters, caves and weapon sites used by the PKK in the southeast and northeast provinces of Hakkari and Kars on Saturday and Sunday. Formed in 1978, the PKK has been fighting the Turkish state for an independent Kurdistan until the early 2000s. The group then shifted its goal to autonomy in the predominately Kurdish regions of Turkey.